After 8 months of U.S. President Trump holding office, the economy has grown only an average of 2%, while the stock market has increased an average nine percentage points year-to-date. Following robust campaign promises to deliver the “best” deals for America, uneasy challenges persist for the Trump Administration affecting the U.S. economy. An imperfect China trade deal concluded after the gift horse U.S. withdrawal from the Trans-Pacific Partnership, updated changes to the North American Free Trade Agreement (NAFTA) remain unresolved, increased trade sanctions have been put in place against Iran, North Korea and Russia, and the socialist government of Venezuela continues to melt into further chaos. But last April, preceding the release of President Trump’s Executive Order – Promoting Agriculture and Rural Prosperity in America, Ray Starling, the Special Assistant to the President of Agriculture, Trade and Food Assistance disclosed the administrations agenda to grow the economy through agriculture. Accordingto Starling’s press briefing, the agricultural community is actively engaged as “a net contributor to lessening the trade deficit…growing more food than we can eat in the United States.” Bi-lateral negotiations involving agriculture are anticipated to improve the economy and job growth. The following day, President Trump’s Executive Order replaced former-President Obama’s informal House Rural Council which did not specifically address economic growth with the Interagency Task Force on Agriculture and Rural Prosperity. The Task Force will identify legislative, regulatory, and policy changes to promote rural America, agriculture, economic development, job growth, and other quality of life issues. Specifically, the Task Force will address changes that ensure access to reliable workforce and increase employment opportunities in agriculture-related and rural-focused business. Although the Task Force findings won’t ensure job growth it may very well recognize that not only the running theme of skilled-labor shortages is hindering business growth but also agricultural-labor shortages are negatively effecting the economy. The struggles with farm labor have been a growing concern for agricultural producers across the U.S. where thousands of farm jobs go unfilled each year. For the last five years in San Luis Obispo County, CA, labor shortages have increased from 15 to 26 percent. In an independent survey by the Grower-Shipper Association of Central California for the 2015 calendar year, an estimated gross revenue loss of $13.5 million (an 300% increase from 2010) was reported due to a lack of sufficient number of field workers. Expectantly, the Task Force will reveal their findings in October or November this year highlighting the field worker shortage. Several factors contribute to the shortage, from a lack of immigration reform to low pay to a higher attrition rate of generational field workers. As a result, the agricultural industry has achieved a point where a surplus of jobs exceeds available workers. With immigration playing a major role in last year’s presidential election, it is not surprising President Trump’s tough immigration policies have been blamed, but in truth, growers are experiencing a long-term residual effect from restrictive immigration laws enacted since before 2013. For instance, after Georgia Governor Nathan Deal signed into law the Illegal Immigration Reform and Enforcement Act of 2011, requiring employees to use E-Verify – an employment verification program – a survey conducted by the Georgia Department of Agriculture revealed the Georgia farmers had a shortage of more than 11,000 farm workers during the spring harvest. Some farmers reported up to 20% labor shortages, leaving unharvested crops. A subsequent report from the University of Georgia for Agribusiness and Economic Development estimated the labor shortage cost Georgia’s agriculture industry almost $140 million. Due to illegal immigration reform in recent years, growers have turned to the H-2A temporary or seasonal agricultural worker visa program, but the program still hasn’t been able to meet labor demands. 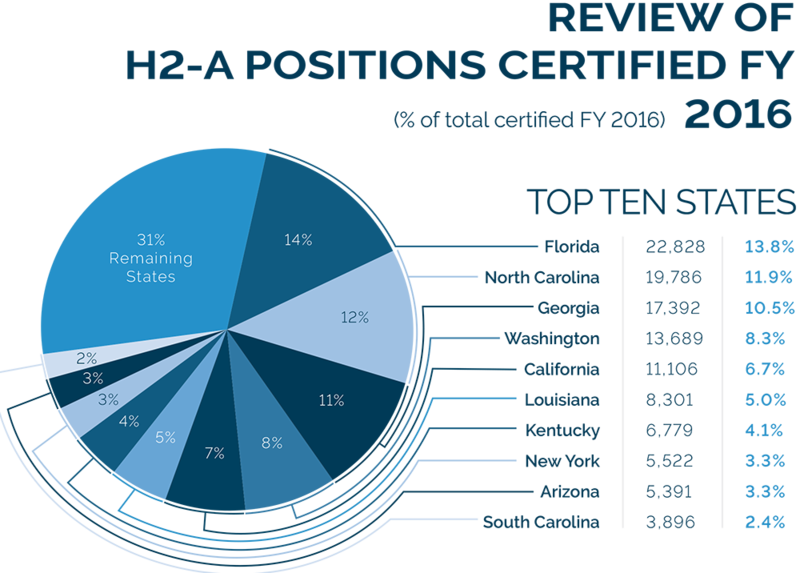 In 2016, a total of 165,741 jobs were certified for H-2A visa applicants (a 14% increase from 2015) but only 134,368 H-2A visas were issued to workers, revealing a 31,000-worker deficit. Plus, the H-2A visa program isn’t without its problems as detailed in the “Cause and Effect” article of the CHTCS Journal Volume I, Issue 2. Guest workers using the H-2A visas are highly susceptible to forced labor conditions through a community recruitment process that often passes on recruitment and transportation fees to the guest worker. The guest worker is further susceptible to forced labor conditions through geographic isolation, no visa portability and a lack of agency over housing options. Although demands for more H-2A visas have been met by the federal government, an agricultural labor shortage continues. H-2A Temporary Agricultural Labor Certification Program –Selected Statistics, FY 2016, U.S. Department of Labor, 2016. The compounding issue of low wages is a contributing factor to both attrition of traditionally generational field workers and the inability of growers to maintain a consistent number of workers. 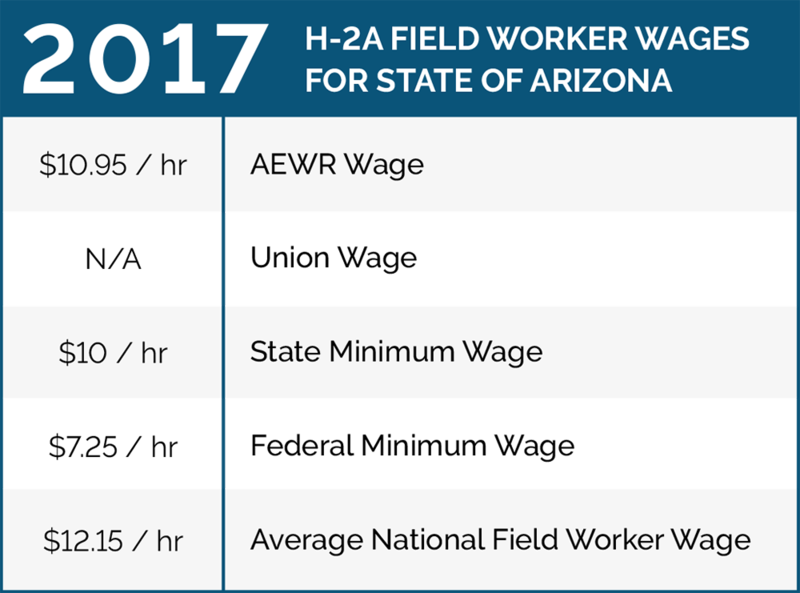 Under the H-2A guest worker program, growers must pay workers the highest Adverse Effect Wage Rate (AEWR) prevailing hourly wage, a collective bargaining wage if applicable or the state or federal minimum wage. Oregon and Washington state have the highest AEWR at $13.38 per hour. FY 2017 Adverse Effect Wage Rates, U.S. Department of Labor, 2017. Farm Labor: April Hired Workers Down 4 Percent, Wage Rates Increases 4 Percent From Previous Year, U.S Department of Agriculture, May 2017. Non-H-2A field workers concede to much lower wages, even dipping below minimum wage levels when incorporating overtime. A combination of varying market prices or market demand for certain crops and weather dependent yields make the agricultural industry a volatile business with little profit guarantee. The typical agricultural worker is paid via a piecework basis rather than an hourly basis usually as contract workers by season or predetermined period. Under the Fair Labor Standards Act (updated in 1966), growers employing more than seven workers in a calendar quarter are required to pay their agricultural workers at least the equivalent to the federal minimum wage ($7.25). Growers may maneuver around the minimum wage claiming workers are autonomous independent contractors, declaring less than 7 employees or charging for shoddy unsafe housing. The drought of field worker availability has become a drain on the U.S. economy and is anticipated to worsen if the Trump Administration continues its campaign promises to build a wall along the southern U.S.-Mexico border and aggressively prosecute illegal immigrants. Inadvertently, the continued immigration measures may improve wages and working conditions for future field workers. The unsettling nationwide field worker shortages have pressed growers to compete for laborers. Although a variety of schemes are offered like higher wages, subsidized housing, and retirement benefits, gaining long-term loyalty of verifiable field workers is not a guarantee. This environment has opened a door for the worker-driven social responsibility (WSR) model demonstrated by the Fair Food Program (FFP). Contrary to the nationwide field worker shortages, the Florida tomato industry is less threatened by a dwindling labor force. As exhibited since 2011, major consumer brands (see ticker chart) have agreed to pay premium prices for tomatoes sold by growers abiding by the FFP Code of Conduct. 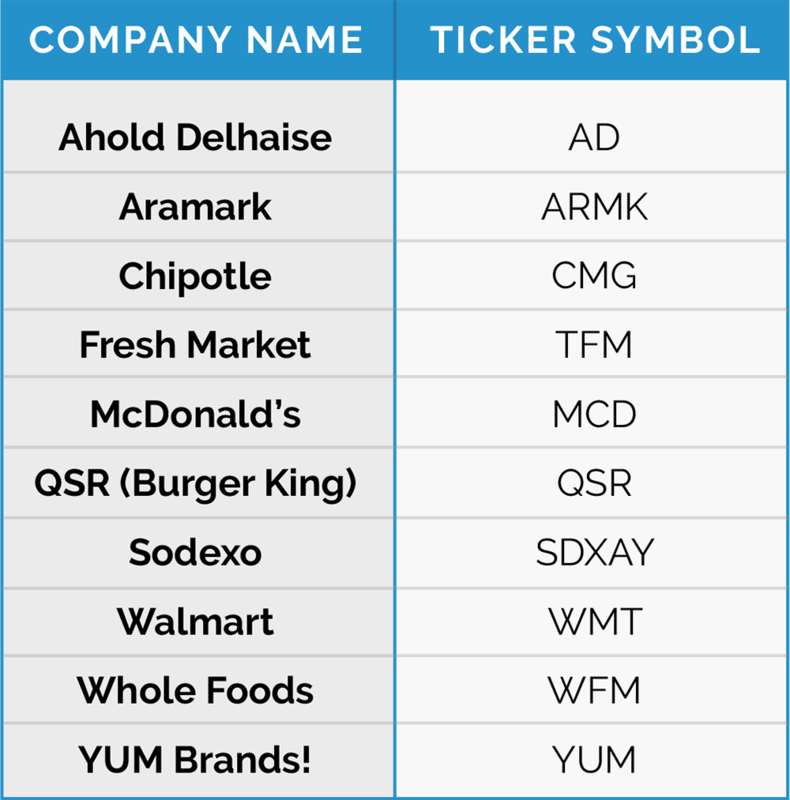 This social responsibility model begins by humanely investing in the workers, educating them and protecting them from forced labor conditions, wage fraud, physical abuse, sexual harassment, and harsh working conditions. In turn, workers have a voice, are paid fairly, are respected, and provide dependable piecework. Under the FFP, labor hiring concerns surrounding the H-2A guest worker program are alleviated by a strict due diligence employment program mirroring Canada’s temporary worker program Fair wages are improved by requiring growers to hire ALL workers as employees thus providing certain FLSA wage guarantees plus a small FFP bonus wage. Overall, the Fair Food Standards Council (FFSC), the third-party assessment arm of the FFP, operates at each stage of production consequently determining if growers should be black listed, potentially causing large profit losses for growers. The reliable and proven resolve of the FFP Code of Conduct by FFP growers has fostered loyalty among field workers and most importantly trust. Workers trust, they will work in safe conditions and get paid with all grievances quickly remedied. Surprisingly, even the WSR model, and other employment perks haven’t increased the workforce pool nationwide, but a precedence of healthy working conditions and higher wages have improved the available migrant workforce. Determinately, recruiting the nation’s remaining unskilled workforce to fulfill the labor demand will require even higher overall wages. As demonstrated by piecework wages, field workers can make up to $18/hr plus certain benefits, but the work is seasonal under harsh environmental conditions and has lasting health concerns. Unfortunately, the agricultural industry is behind the Fair Food Program curve and buyers continue to drive field worker wages down comparatively to the increased cost of living. Until this dynamic is upended, the growers remain in competition for each other’s labor. Enticing non-skilled, non-immigrant workers to the fields will be a daunting task for President Trump’s Interagency Task Force on Agriculture and Rural Prosperity and its goal to improve the economy through agriculture. Whether it is legislative action, ethical investing through WSR programs like the Fair Food Program or supply/demand raised wages it is evident there is a need for improved ethical, fair and humane labor force solutions in the U.S. agricultural industry.